A little collaboration can be a dangerous thing. Think about its impact on popular music, for example. Kenny Rogers and Dolly Parton on their own? Amazing. But their 1983 hit “Islands in the Stream”? I’ve already infected my head for the next two hours just typing the title. When it comes to beer, for the past few years, collaboration has met with consistently positive results. Like singers, the artists who create ales and lagers get restless for inspiration, or sometimes they admire the talent of another brewer and want to see if by working together they can raise one another’s game. I decided to get together with my buddy Ray Brown, a songwriter and musician himself, to try three collaboration beers to see how they paired with various foods. Like with some duets, a few of our pairings were doomed from the start (like “Best Things,” as sung by Clint Eastwood and Lee Marvin from 1969’s “Paint Your Wagon”). Others were pure Louis Armstrong and Ella Fitzgerald. What is a collaboration beer? Well, when two (or more) breweries love each other very much, they sometimes get together and make a beer together. Breweries typically choose one of the breweries to be where the limited edition beer is made, but other times they’ll split the recipe and see how it turns out in separate locations. One of the reasons why they are becoming more popular over the past few years, according to brewmasters in their reflections on the process, is that it stimulates the creative process and gives brewers a chance to learn from one another. Brooklyn Brewery brewmaster Garrett Oliver, for example, worked with Brakspear Brewery in Henley-on-Thames in England to create his Brooklyn Bridge Bitter. Boston’s Samuel Adams worked alongside German brewery Weinhenstephan to create a champagne-like beer. In these cases, American brewers were going to the roots of beer styles to pay tribute to the masters. Deleware-based Dogfish Head knows about collaboration, and one of the more powerful results of one comes in the form of Life and Limb, made with California-based Sierra Nevada Brewing. 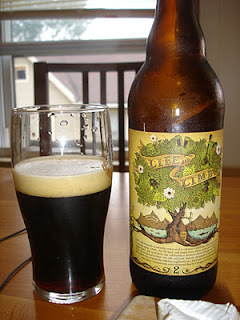 Ray and I tried this dark, high-alcohol ale as the first in our taste test. Dogfish Head President Sam Caligione calls it “somewhere between a brown, a porter and a stout,” but Ray and I just called it a syrupy blast. It’s made with two different tree syrups: maple, from Western, Mass. (where Caligione is from) and birch. Sierra’s contribution is in the hops, which include the Bravo style, which is very citrusy. We paired this, along with the other two beers, with Edam (a semi-hard Dutch cheese), brie and bleu cheese. We also had them with hard salami and chocolate – but not at the same time. We both found Life and Limb to had a syrupy richness with dark fruit undertones, something akin to raisin. Ray said it was “chock full of life” We also agreed that it tasted best with the brie. “Not only does the brie bring out the taste in the beer, the beer brings out the taste in the brie,” Ray said. Obsessions with foreign brewing styles are natural for an American brewer. Oliver’s collaboration with Munich’s G. Schneider & Sohn to create a weissbier was a hit, for example, and recently Stone Brewing of California announced it would release a collaboration beer with Ishii Brewing in Guam and Baird Brewing of Japan to make Japanese Green Tea IPA. All sale proceeds will go to tsunami relief efforts in Japan. For Brewery Ommegang of Cooperstown, NY, pairing with a Belgian brewery just makes sense. Ommegang itself is run indirectly by the Belgian company and brewer Duvel, and Ommegang’s collaboration with Brasserie d’Achouffe is very consistent with the whole Belgian beer tradition. 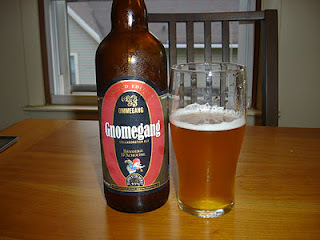 They created Gnomegang (that’s a play on the fact that d’Achouffe uses a cute gnome on its bottles) to create a strong Belgian golden ale. As with most Belgian ales, the distinction comes through in the yeast. In this case, that’s where the collaboration is: it uses d’Achouffe yeast in the primary fermentation and the Ommegang yeast in the secondary. Ray and I liked that this was a contrast to the Life and Limb. While its aroma advertised that it might be a little funky, the taste was quite dry and clean. Hands down this went best with the brie, or as Ray put it, “I’m getting the full flowering of the flavor.” It went well with the salami too, but could not compete with the bleu cheese. Out of the beers, it was the only one that didn’t drown out the Edam, and actually brought out some of its nuttiness. The final collaboration beer is not from your typical collaboration. 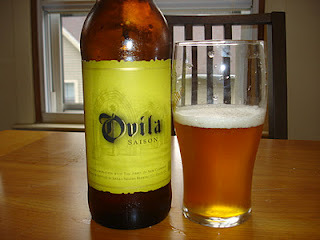 The saison, called Ovila, is made by Sierra Nevada as part of a partnership with the Abbey of New Clairvaux, a California monastery 20 miles away. This is another tip of the hat to Belgian craftsmanship but out of the three beers this one had the best back story. A portion of the proceeds from the sale of this and two other Belgian-style beers will go toward the restoration of the historic Ovila chapter house building on the grounds of the abbey. This medieval building was begun in 1190 near the village of Trillo, Spain, where monks lived and worked at the Santa Maria de Ovila monastery for nearly 800 years. In 1931, newspaper magnate William Randolph Hearst purchased the abbey, took it apart and shipped it to Northern California with plans to rebuild it. That never happened. In 1994, the monks of the Abbey of New Clairvaux gained possession of the ruins, and began to reconstruct the abbey. So, this isn’t strictly a collaboration between two breweries, but was Paula Abdul’s collaboration with MC Skat Kat on 1989’s “Opposites Attract” equally illegitimate? I rest my case. Ovila is dry and almost peppery in its finish. It intensified the rather quiet Edam cheese, but it “de-harshed” the bleu cheese, as Ray put it. I thought that the saltiness in the hard salami brought out the ale’s hidden maltiness. 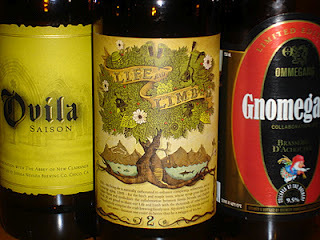 This entry was posted in Beer Snob and tagged Dolly Parton, Gnomegang, Kenny Rogers, Life & Limb, Ovila. Bookmark the permalink.